For more than a half century, it has been the people at Onan who made the company a success, but it was sound and innovative marketing that gave those people the strategy they needed. Of all the thousands of difficult marketing decisions made over the years by Onan executives, the one that finally evolved in 1947 undoubtedly was the key to the company’s present success as a world leader in power generation equipment. That was the year D.W. Onan and his sons. Bud and Bob, decided that manufacturing generator sets for retailers, such as Montgomery Ward, to be sold under the retailers’ brand names, would hamper Onan’s future growth. Although the company’s private-label business was growing and was profitable, there was discomfort over Onan’s destiny being subject, to such a great extent, to the willingness of the mass merchandisers to promote Onan products. Prior to World War II it was the additional sales of Onan products by Montgomery Ward that, in a large part, were responsible for the company’s surviving, so there was a certain amount of loyalty to this class of customers as well as apprehension over the prospect of doing without them. Several other mass merchandisers had joined Montgomery-Ward as important Onan customers, including Fairbanks-Morse, Wind Charger, Winco and others. There were two main disadvantages of relying on private-label business, however. (1) Onan’s growth could be seriously hurt at any time merely by one or more of these retailers’ deciding to drop Onan as a supplier. 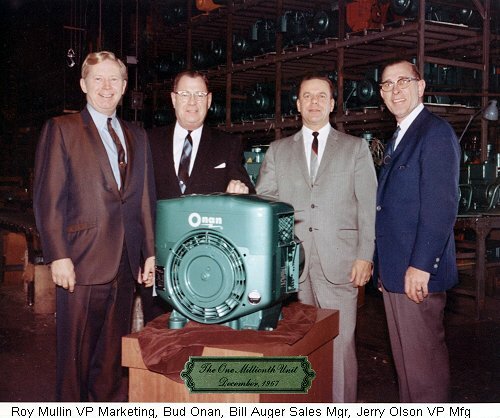 (2) None of the mass merchandisers offered the type of service to buyers of generator equipment that Onan felt was essential to keep customers satisfied. In addition to the private-label business, Onan had, since the founding of the company back in the 1920s, relied heavily on direct selling through small magazine ads and promotional mailings. The decision made in 1947 was to set up Onan’s own domestic and international distributor network and gradually to eliminate marketing through private labels and direct selling. It was a crucial move and the timing was critical. In retrospect, the decision was a wise one and the timing was perfect, although it took several years to fully implement it. Since the 1947 decision, Onan’s marketing strategy has undergone substantial changes at times and is constantly being fine-tuned, but it remains basically the sale of Onan products to the end-user through a comprehensive network of distributors and dealers. Today there are Onan distributors in every state in the U.S., who, in turn, have more than 2,000 dealers across the nation. In addition, Onan’s International Division has approximately 100 distributors worldwide in about 75 foreign countries. Onan also sells products directly to original equipment manufacturers, to the U.S. government and the company has even re-entered the private label business in areas it felt it could not reach through the Onan distributor-dealer network. The overwhelming success of the distributor-dealer strategy can be attributed to the extreme care Onan has taken over the years in screening and selecting the distributors in this network. And the network is more than a sales organization. It also provides Onan customers around the world with parts, service and application engineering. Onan always has had a pledge to service its products, no matter how or where they are sold or used. At the company’s Service Training Center in the Twin Cities, a special training staff is continually instructing field service people on how to repair and maintain Onan products. Onan frequently brings its distributors, dealers and other customers to the Service Training Center for seminars on proper servicing technique. Onan’s international staff, in addition, conducts training schools in foreign countries. The international market for Onan products has been growing gradually since the end of World War II and today represents a very significant portion of Onan’s total business. Foreign sales have had some wild ups and downs during Onan’s first 50 years. Since 1971, however, overseas growth has been carefully planned and pursued, and the wide fluctuations are much less frequent than in earlier times. Prior to World War II, 80 percent of Onan’s total sales came from foreign countries, but in the years immediately after the war, this part of the company’s business was insignificant. During the 1950s and 1960s there was an attempt to increase overseas sales, but proper attention to this potential market was never achieved. In early 1972, Onan decided to split international sales away from domestic sales where it had been treated as a step-child. International has since achieved division status within Onan, and it now has all of the functions of a free-standing business unit except manufacturing. In 1972 Onan’s export sales were well under $10 million a year. Valenty gave the newly formed international group a goal of $50 million annually in sales. The goal was reached and exceeded significantly in 1981, although International Division sales turned down in 1982. A parallel can be drawn between Onan’s marketing efforts internationally and with it U.S. government sales. During World War II Onan was the primary supplier of generator sets to various military services, producing a peak of $50 million a year in government business. This dwindled after the war to practically nothing and government business didn’t pick up again until a concerted effort was made by Onan in 1960 to acquire military contracts. Onan had played a modest role as a supplier of generating equipment to the U.S. military during the Korean conflict in the early 1950s, but marketing results were far from impressive. In 1960 the company made a decision to actively pursue U.S. military business on a permanent basis, but unfortunately, Onan had let that market slip to the point it didn’t even have the initial contacts in which to start a sales campaign. Tom Valenty, who knew an official at the Engineering Research and Development Laboratories of the U.S. Army at Fort Belvoir, Virginia, volunteered to assist Onan’s marketing people in establishing military sales. Unknown to Onan executives, however, events were to occur to make their two-year investment worthwhile. In October 1962, Valenty received a phone call from his acquaintance at Fort Belvoir. He asked Valenty if he had read the morning paper yet. Valenty said he had not. Valenty’s Army friend said, “Well we might be at war today, and we don’t have any generator sets to fight a war with.” He was referring, of course, to the Cuban missile crisis and to the confrontation between President John Kennedy and Russia’s Nikita Khrushchev. Valenty was asked if Onan was willing to quickly build 12,000 five-kilowatt military design generator sets. “I was elated,” Valenty says. “Here was our chance at an order after two years of coming up empty-handed.” Valenty was asked for a price on these 12,000 sets, and Valenty replied he would need drawings and specifications. He was told there was no time for that, and that a price would have to be submitted that afternoon. Valenty says, “What do you do when you. are offered a tremendous opportunity, but have no drawings or specifications to work with? They wanted a price in four hours, but no one in manufacturing, finance or administration at Onan knew anything about the product. ” Valenty sat down with Harry Jorgenson and the head of Onan’s costing department and they worked out a price from the limited facts available. Onan quoted the price to the military and won the contract. In executing the contract, Onan had to completely redesign the family of military five-kilowatt sets so they could be built on a production basis. In the process of developing the generator set, Onan had to upgrade its drafting, engineering, technical manual and quality assurance capabilities. “We were a much better company by the time the production contract was completed,” Valenty thinks. From this initial contract, Onan went on to produce tens of thousands of five-kilowatt sets for the military, thousands of 1.5-kilowatt military design generators and regulators, some ten-kilowatt sets and the first production quantities of the 60 kilowatt military standard sets. Onan became a major supplier of generating equipment to the military during the Vietnam war. The successful financial performance in the military set business provided the drive to build the Fridley facility in 1968 and 1969, and the strong cash flow from government contracts enabled the company to finance new product development, new production equipment and other marketing programs. It’s probably accurate to say that Onan’s present market strategy had its birth in 1947, became of age in 1958 when “new blood” was brought into the marketing department, and since then has constantly refined its sales programs to where it’s the envy of its competitors today. Onan’s financial results bear out that assessment. Business increased from the $11 million annual volume in 1958 to $20 million in 1963 and $63 million in 1969. By 1973, Onan passed $100 million in annual sales, and has had steady growth since then, reaching today’s present annual volume of around a quarter-of-a-billion dollars. This amazing growth has been fed by many different factors, but Onan’s marketing strategies can take much of the credit. It’s obvious that this marketing strategy has been held together over the years by a single characteristic—persistence. As the strategy evolved, Onan was persistent in its marketing plans, and this persistence has more than paid off in growth and profits. [ Ed. Note. In large part, the stagnated sales spoken of in the 1950s was the result of a stagnated Vice President for Sales. Brought up in the early iron peddler tradition, he needed to retire. A sadly omitted part of this story is the contributions of Roy Mullin and Bill Auger. Bud Onan, my dad, could see what was happening and knew what he had to do. Vice Presidents could only be replaced by Bud and Jack Shea, the Executive Vice President. A professional search was initiated and candidates narrowed down. I remember my dad’s comment that the candidate he liked best was going to be non-traditional and perhaps hard to contain. But he said that he would rather try to focus the man’s energy than whip him into activity. That candidate was Roy E. Mullin. Roy came from an automotive background, but not a technical one. In fact, Roy would never learn much of the technical details of Onan generators. What he did well was inspire people and lead the charge. With him came Bill Auger. Bill was a counter point and able to carry out Roy’s programs. Roy brought the concept of Marketing to Onan. That is sales, promotion, market research and customer service. We called ourselves the “World’s Leading Builder of Electric Power Plants” but did not look like it with 1 inch ads in Popular Mechanics. We re-assessed our advertising strategy, changed frequency and space size to look like a leader. Some of the full page image building ads in Fortune featured Bud Onan talking about the product. He owned the company. Most other advertising was in prominent trade journals with hard hitting copy aimed at customers and buying influences. The perception was that not all competitors units would perform to their nameplate rating. A program of “Performance Certified” was begun. Each unit shipped with a certificate saying it had been run and tested to assure it would meet its nameplate performance rating with instruments who’s accuracy was certified by an independent testing laboratory. Many assemblers built standby generator sets but manufactured none of the components. Then there were the engine or generator builders who assembled. Along with a standby installation was switchgear to control the units start up, switch the load to the generator, and return to normal status when the commercial power returned. Onan could say it manufactured the complete package and therefore was the only company who could take complete responsibility for the installation. We called it “Unit Responsibility.” This was another item to spotlight the difference in our products. OEM customers need special handling because they are not a client you typically advertised to. Canadian fishing trips and sport outings, with the principal executives of the customer and Onan, created a personal relationship that encouraged sharing ideas and concerns. Knowing the customer on a first name basis meant it was more likely we would be called than dumped. The company airplane, a DC-3 converted specially for executive travel, was used to bring Onan prospects, customers and buying influences, like architects and engineers, to the factory for 3 day conferences on Onan products. All expenses paid! This was very well received and made the airplane a profit center. Not often a corporate airplane pays for itself. Roy loved to be a showman. In one instance he literally threw down the gauntlet to Sherwood Egbert, who was then President of Studebaker-Packard and about to introduce his pet project, the Avanti car; as to who would return the most profit to the corporation. Of course, Roy won! He established a fraternity called Onan Marketing Leader for the person(s) who contributed most to marketing for the year. They got bright red sport coats to wear at all official Onan events. These programs under Roy’s leadership had much to do with pulling Onan out of the ‘50’s stagnation. He nurtured growth in the motorhome, standby and OEM markets. Unit Responsibility put service and parts in a prominent position. The Look of Leadership was recognizable company wide.